I'm an introvert. Maybe that's hard to pick up if the only way you know me is through this blog. I come across pretty well in writing, but put me in a room full of people I've never met and I'm apt to fade back and observe rather than engage. Certainly there are artists who are extroverts, but an awful lot of us are introverts, and this is never more painfully obvious than at an art opening. - The IPCNY staff set aside the first hour just for artists and members. This gave us the opportunity to really look at the work that had been selected, to stare at each others' name tags and figure out who belonged to which work, to introduce ourselves, to ask each other questions and to talk shop. Nothing overcomes the shyness of a printmaker faster than a chance to talk about technique! I also got to meet a couple of the people who had been on the selection committee and it was interesting to hear a little bit about their process and what they saw as the themes running through the show (maps, landscape, sense of place and dystopia). - The IPCNY staff were present, available and enthusiastic and they did everything they could to help us feel welcomed and comfortable. Director Anne Coffin took a few minutes to chat with Lynn and me, and I especially enjoyed speaking with office administrator Amanda Young and an intern named Guillome. - Artists like other artists. It reminds me of my dog Ty, the yellow lab. When he sees another lab on the street, especially a yellow one, he always always wants to check them out. I find artists are like that too, especially printmakers. I was happy I got to meet Victoria Burge, who often comes to Zea Mays Printmaking here in my town to print. I also spoke with Nicholas Brown from Washington, who does intricate linoleum carvings of forest floor underbrush and Ross Racine who makes very interesting digital drawings that are aerial views of imaginary (and kind of frightening) suburbs. I also enjoyed speaking with Daryl Vocat, an artist from Toronto who worked with screenprint images that seemed to be from old boy scout manuals. Other highlights of our whirlwind 24-hour trip to New York included a visit to Pace Prints, where we saw a room full of professionally produced moku hanga prints including the 16-block woodblock above done with Helen Frankenthaler. I've been on Twitter for several months now and something I've noticed is that occasionally little "themes" will float their way through my Twitter stream. I follow a lot of artists on Twitter, and today there was a strong theme among the artists about ways that their endeavors are not supported by coworkers, friends, and especially family. And then there's my mother. That's her in the photo, sitting in the back seat of a huge tow truck the day she and I got stranded in Vermont in the pouring rain after her car broke down out in the middle of nowhere when we were on our way to a family reunion, which we never made it to. 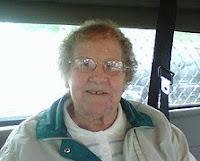 She's 83 years old, and still as curious about the world as she was when I first met her 50 years ago. I can't say that she and my father took to the artist thing right away. Let's face it, freelancing isn't the most secure thing a parent can imagine for their child, and fine art is even worse. But over the years they could see that I loved it, that I was doing OK at it, and that they didn't have to send me money, so they started to relax. My dad died before I started doing printmaking, but my mother has been amazingly and beautifully supportive. She reads my blog (hi mom! ), she thinks deeply about my work and makes wonderful comments about it, and now she does send me money sometimes, like when I'm headed to NY or Seattle for an opening. I know how lucky I am to have her support. I've also come to realize how important it is to have friends who are artists. I've certainly made some wonderful virtual friends on the internet and through this blog. I think a lot of artists make those contacts in art school, but seeing as how I never went to art school and never had many artist friends, I've started to look for those relationships locally. I've discovered a whole network of printmakers affiliated with local Zea Mays Printmaking, I have a small illustrators group with Kim Rosen and Daniel Guidera, I've forged a friendship with Peter Pettengill of Wingate Studio in New Hampshire, and just today I met local artist Ariel Kotker, a sculptor who is creating a "walk-in novella" from thin air. She came here for a studio visit, which I'll reciprocate in November, and we had a great time talking as if we already knew each other. And then there are my long-time friends who aren't necessarily artists but who are willing to let me rattle on about my latest series or my conflicts between making art and selling art -- letting me "shop talk" even though it may not be their kind of shop. I know that they're rooting for me, too. Making art is wonderful, and it's hard sometimes, and it can be lonely. I'm cherishing the people who hold me up, who hold me accountable, and who hold my hand. Thanks, my friends. I've been an illustrator for a long time and even though the industry has changed tremendously since I first started, I still know basically how it works. To market yourself as an illustrator, you first need a web site. Then you might add samples of your work to one or two portfolio portal sites such as theispot.com or folioplanet. You should also make and maintain mailing lists of old clients plus prospects you'd like to work for and send out postcard mailings to them at least a couple of times a year. There are lists you can buy, such as Adbase, that allow you to compile targeted lists for your mailings which, although pricey, are up to date and invaluable for finding new contacts. But I'm finding that fine art is a whole 'nother animal. Fine art connections can definitely be made online, and having a web site seems important for a fine artist. But is there an equivalent to "portfolio portal sites" for fine artists? There's Saatchi Online which has so many thousand artists on it that I can't imagine many of them get seen in a meaningful way. Are there mailing lists? Probably. A quick Google search listed a few. But what good would it do to simply have (buy) a list of all the galleries in a certain city? Only a fraction of them would be interested in your particular kind of art. I faced these issues this week as I wrestled with the question of how to best take advantage of the fact that one of my prints will be in New York City for the next month. I decided to act like an illustrator and have a postcard made, and I've been collecting a short list of people in the NY metro area to send cards to. First: friends and family. Next: all my NY-based illustration clients. And then I looked for galleries to alert. The IFPDA Print Fair will be happening while my print is hanging, so I looked at the list of exhibitors and added a few who deal in contemporary prints to my list. Then I got a copy of the August issue of Art In America and went through the NY gallery listings. About 800 of them. I was able to eliminate quite a few of them just from the descriptions, but I looked at the web sites of maybe 1/2 of them. I found about 40 that deal with work something like my work and are open to emerging artists and added them to my mailing list. All of this took about 3 days. I have a list now of about 100 people to send cards to announcing the IPCNY show. Is this how fine artists do marketing? I have no idea. But this is how illustrators do it, so it's all I know how to do. I'll let you know if anything comes of it. Lynn and I will be traveling to NY for the opening of the New Prints 2009/Autumn show at International Print Center NY on October 29, 6-8 pm. I hope those of you in the city will stop by and say hello! I knew I had good reason to be afraid of this Vast Unpeopled Lands print, and I was pretty sure that the main reason to fear was the fact that it's so big. I'm using a half-sheet of Nishinouchi, so the paper is 21 x 29 in / 53 x 74 cm and the block shown above is 20 x 30 in / 50 x 76 cm. I've discovered that the bigger the print the more difficult registration becomes. I knew that the tightest registration on this print would be the constellations, because they're composed of fairly thin carved lines that create white areas in the ink of the printed sky. Any off-registration on the multiple passes necessary to get a gradation in the sky printing would fill in the white lines. If you look at the photo of the block at the beginning of this post, you can see that I put the corner kento at the bottom right. If I had thought it through and put the kento at the top where the sky is (and printed "upside down") the registration would have been much easier, because the closer to the kento the better the registration. It would have been even better if I had used a kento notch instead of the corner as I did on my Three Prophets prints. Obviously the top print in the photo above is not salvageable, but many of them are just a little "fuzzy" in the corner farthest from the kento, like the one in the middle in the photo above. I like it a lot, so this is what I'm going to do on all of them. Since I'm going to be adding quite a bit of moisture to these prints as I continue adding layers and I'm not sure how the painted-on ink will react to water, I'll wait until the end to do the rest. But at least I can relax, knowing that I have a fix for this. Phew! 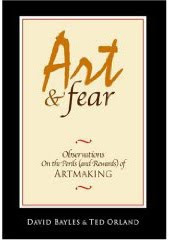 Art is scary. I just requested this book from the library today. It's kind of a cult classic among artists and I've read it before, but I need to read it again. Every so often I freeze up in my art making process and then my task becomes doing whatever it takes to get myself working again. I know this book will help, and I thought that maybe blogging about it would help, too. This freeze seems to have emerged from a number of factors. A rush of illustration jobs has kept me away from the studio for several weeks, which can cause blocks even if there are no other issues. This absence from the studio has come at a critical point in the flow of my Pilgrim project, though. I'm just now facing a transition in the flow of the work from one point of view (the Pilgrims) to another (the native Americans) and it's daunting. Whatever I do with this next print will set the tone for the subsequent ones, so it feels like a lot of pressure. Then there are the simple rigors of daily life, the stress of a sick dog, household things that need to be taken care of, family obligations, visitors from out of town, teaching a workshop -- all things that become excuses for why I can't focus on working. And then there's the sudden influx of good news. 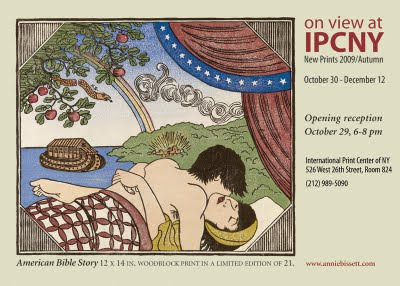 I was just notified that not only was American Bible Story accepted for the Robert Blackburn Printmaking Studio show, it was also accepted for inclusion in the IPCNY New Prints 2009/Autumn show. All of this is wonderful news and I'm very very happy. And I feel just a little secretly afraid that I won't be able to make any more work that will measure up. All these are reasons to get into the studio and get moving. Tonight I dampened some big sheets of Nishinouchi and finished carving the sky block for the Vast Unpeopled Lands print. The next step is to do some printing, even before I carve all the blocks. This one is resisting pre-planning. Seems that I just need to feel my way into this, let the print teach me how to print it. Is that scary, or what? Which is why I need this book, to remind me that this is how it's supposed to feel.